Canadian Mark Taliano has brought together an excellent mix of anecdotes and analysis to create a very accessible short book on the terrible Syrian conflict. It should serve as a primer for all those who feel curious, dissatisfied or cheated by the near monolithic war chorus of the western corporate media. Mark Taliano’s book provides a convincing testimony to the bravery and resilience of the Syrian people, who have been fighting against an alliance of Western aggressors and Islamic terrorists for over six years. The fact that one of the oldest cultural nations of the world is bombed back to the Middle Ages by the West and its Arab allies is not only a colossal war crime but also a crime against humanity. 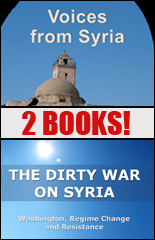 The book corrects a large part of Western propaganda claims on Syria. Very readable and revealing. Mark Taliano is not arguing over details and he is right. After reading his beautiful and invigorating book, you will never forget those “Voices from Syria” that the West has refused so obstinately to listen to. The writer’s honesty, his frankness, his refusal of any intellectual game at the expenses of the suffering Syrian People are such that his pleading can’t be contested. Through the authenticity of his “Voices from Syria” and the accuracy of these genuine testimonies, he shuts the door on the miserable and shameless lies and false flags of Western and Islamist [Wahhabi] propaganda. 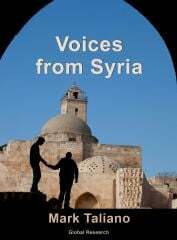 Voices from Syria is a small book with a big message. It would be perfect to use in a group of concerned activists meeting to discuss and disseminate the truth about US or NATO foreign policy in Syria. . It could be used in a classroom or in a library reading club.